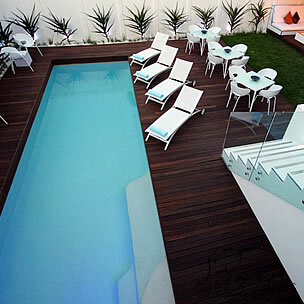 Innovative contemporary style meets urban cool - Villa Zest Boutique Hotel offers sophisticated luxury in an intimate, relaxed setting amid the bustle of the animated Green Point district. Villa Zest is ideally situated bringing you everything the city has to offer; palm-lined beaches, the vibrant business district, a variety of up-market restaurants, cafes, bars and nightclubs. The renowned V& A Waterfront and 2010 Soccer Stadium are in walking distance from the hotel. Cape Town International Convention Centre, Table Mountain and the popular beaches of Clifton and Camps Bay are all in close proximity. An essence of retro cool and luxury calm enhance the contemporary architecture of this design hotel. Bauhaus-inspired, each individually decorated en-suite room boasts a natural flow of white, glass and stainless steel seamlessly fused in splashes of modern colour. Rooms are all modern open-plan with only the finest in bed linen, furnishings and fittings having been used. Unique to the Villa Zest Boutique Hotel is our collection of long-forgotten, trendy consumer electronics from the 70's. Collectables such the novelty Toot-a-loop and Panapet radios are among some of the gadgets featured in our object art gallery. Indulge your senses with our gourmet breakfast; a sumptuous delight of taste sensations in our spacious lounge dining area or down by the pool. Enjoy delicious sandwiches on our rooftop terrace while taking in the view of the city skyline or a complimentary drink down in our Bedouin garden oasis upon arrival. Personalised service, an intimate knowledge of what's hot and not in the Mother City and a network of leisure on hand - let the Villa Zest team pander to your every whim. We'll help you organise your tours, excursions, extreme lifestyle activities, wellness treatments, retail therapy experiences, wine tasting, and so much more. 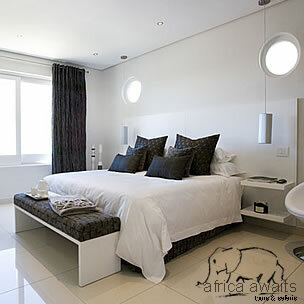 With your holiday, safari or business trip from in to Villa Zest Boutique Hotel in Cape Town.